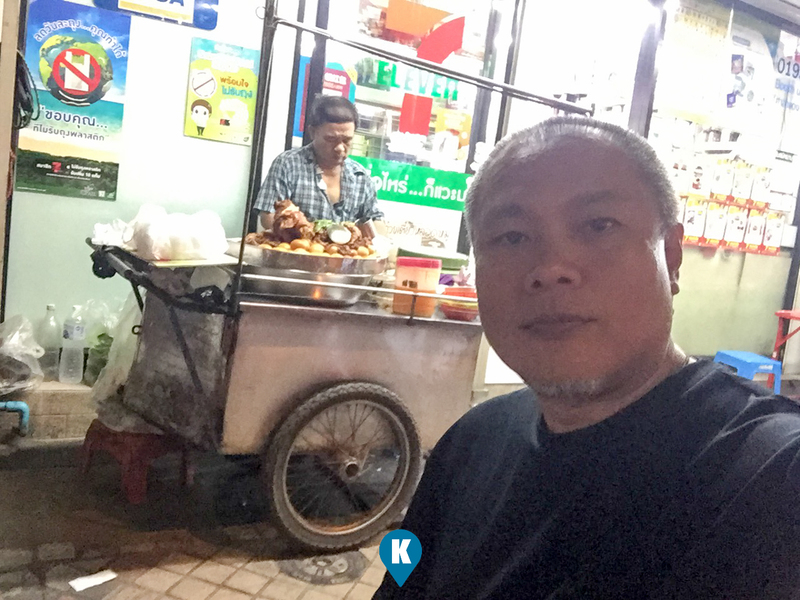 During my first here in Bangkok, I fell in love with the city. The food, people and culture has a warm feel to it. A tourist would easily get accustomed to the place with ease. 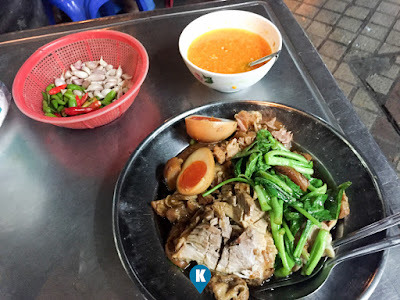 Now that we came back, let me extol my fave street food here in Thailand, the stewed pork. This is almost as common as Pad Thai, or Mango with sticky rice. Not only sold in restaurants, its mostly seen in food carts along the sidewalks. You see them often in the evenings, as I recently learned, there is a crackdown against these ambulant vendors. Daytime, I seldom see them as they are always on the run from the police. So they ply their trade at night. Bangkok nightlife is something a tourist must experience and its safe, surprisingly safe. On my second night here in the city, I had to get out and look for this stewed pork. For our Filipino readers here, its similar to our Patatim (almost). Uses the same ingredients (I think) and smells similar (almost) as well. The difference? 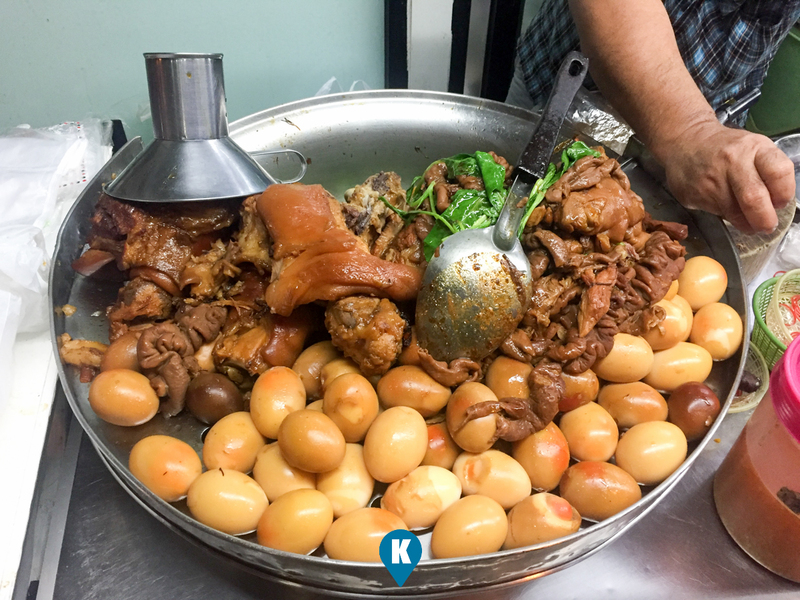 They offer boiled eggs, stewed pork innards as well, to go along with your pork. Actually these are add ons if you don't feel like eating intestines and other parts unheard of a pig. LOL. For a regular dish or pork alone, its THB70 or roughly PHP117. Add THB20 or PHP33 more, you get the eggs and the innards as well. For the pork alone, you can be satisfied already with it. Its like what I said earlier, tastes like Patatim or a bit of Adobo with herbs. If you want to take this dish further up in the taste chain, I strongly suggest getting the egg and the innards. The egg is easy to suggest, but the innards, I think this might not sit well with others, so take some bit of caution on the latter should you not like it. Service wise, since its street food, simply approach the guy then haggle for the price. We went down to THB70 from THB100. He saw me as a tourist so he gave me a higher price so I tried to see if I could drive it down, and we did. After agreeing with the price, he pointed to me to take a seat while he prepared the food (sorry I was not able to take pictures or video of this). I thought the food was just to be scooped from the big vat he had and serve to my plate. I was wrong. 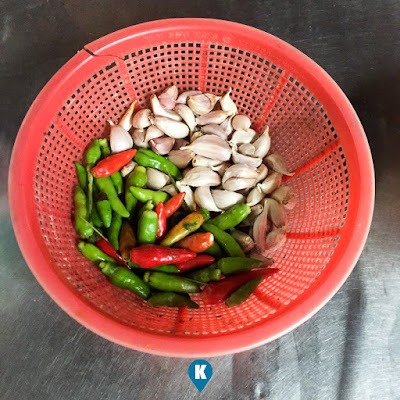 With fast precision, he scooped a large piece of pork and some long strings of intestines and a big portion of what I think I saw was the pig's cheeks. He then placed them unto a chopping block and proceeded to slice, dice and almost minced them. Placed them on my plate over hot steaming rice, sliced an egg in half and topped it with steamed/ stewed vegetables. Under just a minute or two, he went over my table and said, "happy eating". By the way, he served the dished with some soup that I don't know what its made of, as we couldn't speak well in english. He also gave me a bowl of chili and garlic. 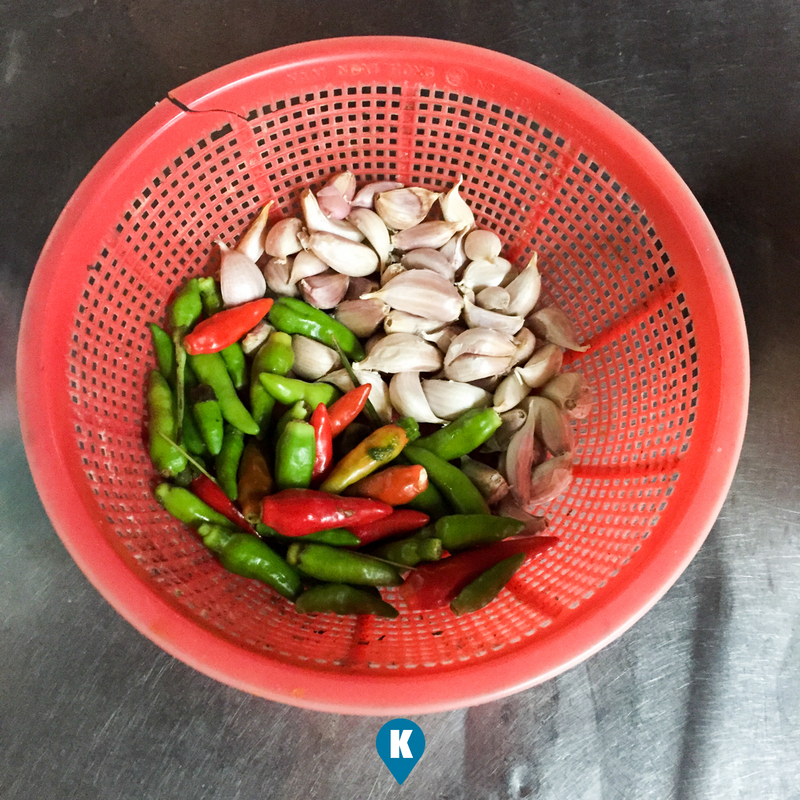 The garlic even if unpeeled is eaten like as you see them (I got this tip from a Thai local). I was shying away from this before as I thought it was a hassle for me to peel them first. Now serving size is a great one. The plate was big, now fill it with a heap of steaming rice, as high as almost 2 inches, then top if off with a pork that covers the rice, then a handful of vegetables. My order was so huge that I had to ask the guy to "doggy bag" half of it. I ate the other half in my hotel the following day. I am a hearty eater so I rarely NOT finish my meal. This night was an exception, I had to say quits and told the guy to bag it. So when you order this, have someone with you to share this with. You will get full and be satisfied I am assured of this. Price wise, THB70 if converted to peso is not your typically cheap. In the Philippines, you can eat street food like this more cheaper, but not with the large servings. Thai people I believe does not scrimp on the serving size. So instead of lowering the prices and offering lesser servings, they opt to retain the servings and simply increase their prices. I think business thinking is something alien to us Filipinos as we try to keep our food prices low and just adjust other things like cutting down on ingredients and the serving size. Not for thais, as I had eaten here for almost seven days and I can assure you, I didn't feel short changed with my food. You truly will get the food you ordered for the price you ordered, period. As this is my favorite food in Bangkok (next to Pad Thai Khung), next time I visit, you will see me again on Instagram munching on this dish. Kap Khun Khrap Bangkok, till we see each other again.